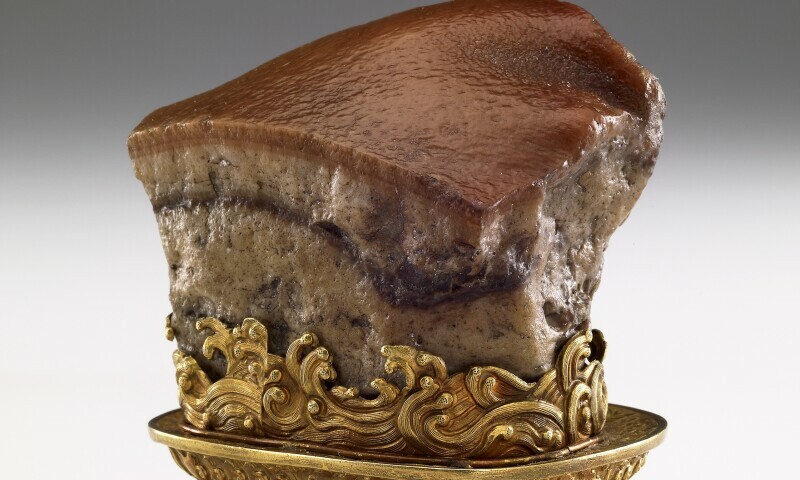 "Meat-shaped stone", Qing dynasty 1644–1911. A rare opportunity to see some of the highest artistic achievements across 5000 years of Chinese history. The National Palace Museum, Taipei, holds one of the finest collections of Chinese art in the world. Accumulated by emperors over centuries, this collection was, for hundreds of years, accessible only to the imperial elite. It is now rarely seen outside Taipei. Celebrating the rich heritage of Chinese civilisation through the ancient concept of tian ren he yi — unity or harmony between heaven, nature and humanity – Heaven and earth in Chinese art presents a series of 87 artworks including paintings, calligraphy, illustrated books, bronzes, ceramics, jade and wood carvings, dating from the Neolithic period to the 19th century. This is the first time the collection has travelled to the southern hemisphere and it is unlikely to be seen in Australia again. The Art Gallery of NSW in Sydney is the exclusive venue.